A sunny and fresh ride out to the other side of Buxton. In the park we had: Simon, Mike, Phil, myself (Ian) and nice to see John making his Larkling debut. The weather was cold with a bit of mist clearing in the hills, with talk of sunshine later on! We headed out of the park and up Blakelow Road, and eventually up to Teggs Nose. At this point Mike decided to turn back, so we were down to four… for now. We pressed on through Walker Barn and joined the Cat and Fiddle road at the crossroads. 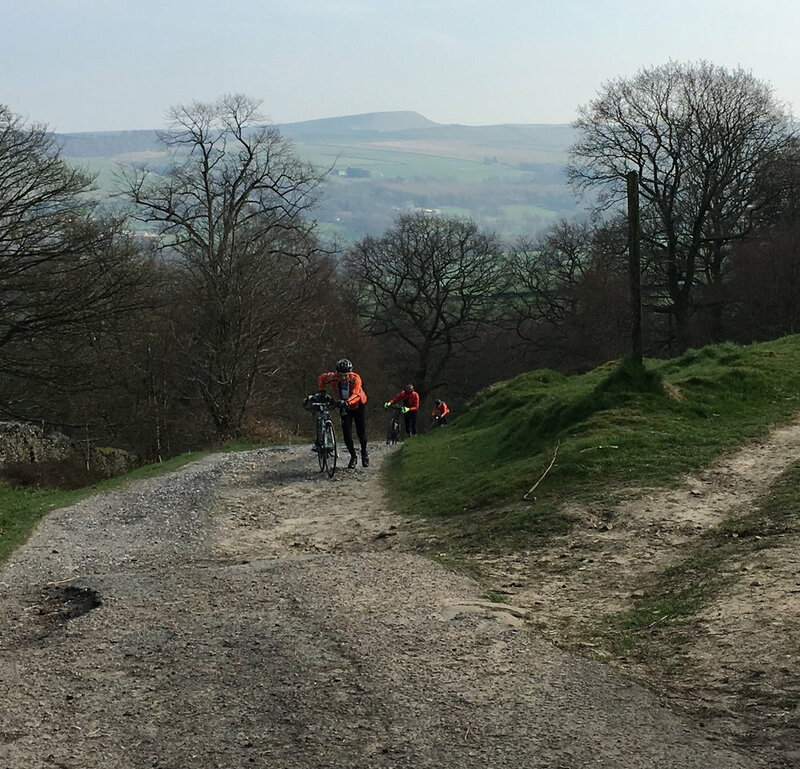 I think the original plan here was to drop down into Bottom Of The Oven and climb back up, but nobody seemed up for this, myself included, so we stayed on the A537 all the way over to Buxton. Simon & John at the summit of the cat. The centre of Buxton was extremely busy with traffic so I was glad when we got out of the centre and back onto the lanes, even if that meant back onto the climbs. The sun had come out by now and it was a nice fresh afternoon. Onto the smaller lanes around Peak Forest and we were caught by the Larks - before the cafe! No Car Cafe was in the middle of nowhere. It was just big enough for the two groups. The staff were very organised / regimented. In a break with tradition I decided against the oatcakes and had a “tommy moz”. Simon forced me to have a carrot cake chaser. Jim turned up alone about 20 mins after we arrived, so the Larklings were back up to five. Out of the cafe it was a short stiff climb (with cold legs), then the long descent into Chapel. I noticed a gold post box in the town, which olympian is that for? On into Whaley, and instead of A roads all the way we peeled of at Linglongs Road. The last time I came this way was on my mountain bike, so I was feeling nervous. We took a right before it got too gnarly, that said Lanehead Road was probably better suited to off road equipment. At least it was quiet I suppose. John, Phil and Jim pushing up Lanehead Road, although “road” might be a bit of a generous description! Jim, absolutely loving the rough stuff. Once we rejoined the main road out of Whaley it was the long undulating road over to Kettleshulme and up to the top of The Brickworks. Loads of other cyclists out, mainly climbing where we were descending. At the bottom of The Brickworks John & Jim turned right to head off toward Wilmslow, Simon, Phil and myself headed back through Bollington and into Macc. My Wahoo is saying 4,500 ft of climbing, not too bad for a 40 miler. Cheers Simon for leading, and Chris for the route.